Product prices and availability are accurate as of 2019-04-25 13:43:38 EDT and are subject to change. Any price and availability information displayed on http://www.amazon.com/ at the time of purchase will apply to the purchase of this product. 1. 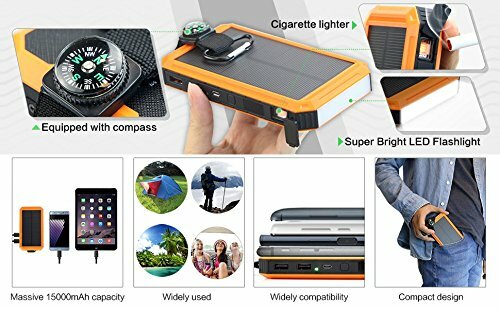 20000mAh high capacity Li-polymer battery with a carabiner, compass, intense heat igniter element function, 8 LED flashlight, 8 LED SOS signal flashlight, and 7 Segment Readout Displaying Up To 100% State of Charge. In daily life, we highly recommend that charge it via wall outlet. 3. For your safety, please DO NOT leave the power bank in your car for solar charging in case of high temperature and avoid crashing. Only charge phones or tablets while battery bank is not being charged from electricity.
? 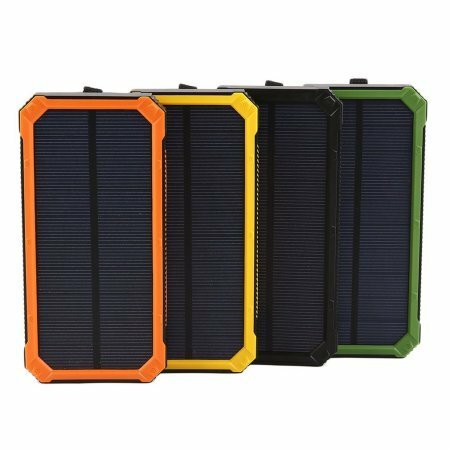 High Capacity: built-in 20000mAh Lithium-Ion battery, about enough to charge an iPhone or Samsung Galaxy 3 times, or iPad Air 2 one and a half times! 30 day money back guarantee. Features include (3) 7 Segment LED readouts displaying up to 100% value. This indicates exact percent of charge left on the battery bank. 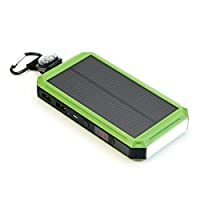 Additional features include element igniter for smoking or starting camp fires, 2 USB outputs, 8 LED flashlight, SOS flashlight, compass and carabiner. ? Super bright LED Emergency Flashlight: 8 LED light on the side of the power bank, great for illumination. Press the power button twice to turn on the flashlight. Press once more to enable the SOS signal. Long press the power button to heat the element igniter for camp fires or smoking. Great choice for camping trips or other outdoor activities, light up your outdoor life! ? Two charging options: Use the included micro USB cable and plug it to a wall charger, car USB, or computer USB outlets. 30 day money back guarantee. Second option is to place the KD-218 solar charger in direct sunlight. Green LED will illuminate while charging in direct sun. Seven Segment LED decimal point will blink while charging via USB option. ? (2) USB output charging ports charge 2 digital devices simultaneously. 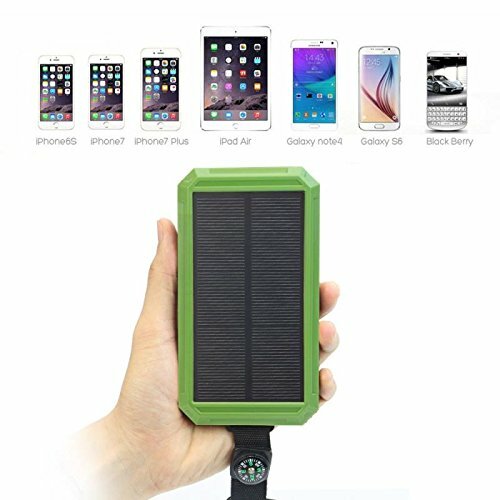 KD-218 Solar Charger will charge your phone very fast. Share power with your friends. ? Other information: Made of ABS material, durable for outdoor use, water and shock resistant. Includes a carabiner and compass. 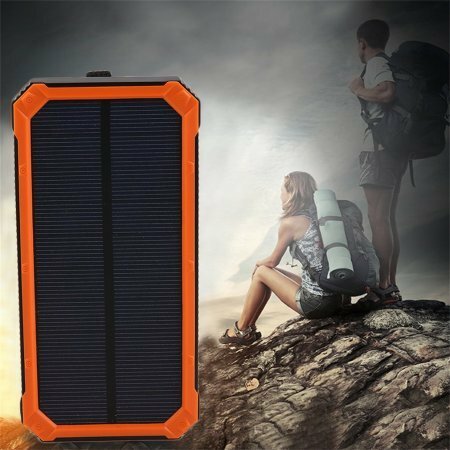 Charge the solar charger by sunlight when on a trip with your backpack. 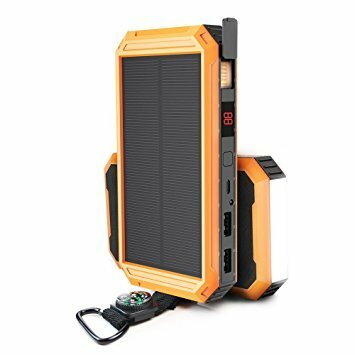 Always fully charge KD-218 Solar Charger via USB prior to heading outdoors as the solar panels is only for emergency power.